Use our RS Electric Motor's Quick and Easy Catalog Search to find the Baldor Electric Motor that you need! 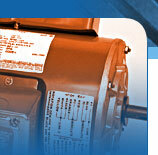 RS Electric Motors is the industrial motor company you can rely on for DC and AC motors, drives, and pumps. Service and repair of Baldor motors is also available. Click to access the Baldor Online Catalog and see the complete line of Baldor products, or request by Contacting Us, or call 800-279-2267 for the electric motor that you need. We'll get you the information you need to make the right choice, at the right price.